LMU biophysicists have used a new variant of super-resolution microscopy to visualize all the strands of a DNA-based nanostructure for the first time. The method promises to optimize the design of such structures for specific applications. 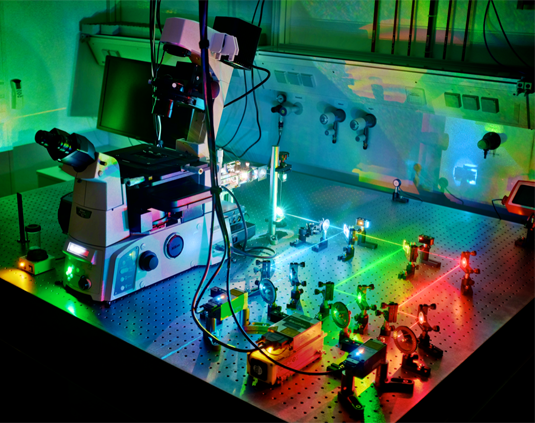 Super-resolution microscopy. With DNA-PAINT it is possible to visualize all the strands in DNA nanostructures individually. Photo: Maximilian Strauss, Max Planck Institute for Biochemistry. The term ‘DNA origami’ refers to a method for the design and self-assembly of complex molecular structures with nanometer precision. The technique exploits the base-pairing interactions between single-stranded DNA molecules of known sequence to generate intricate three-dimensional nanostructures with predefined shapes in arbitrarily large numbers. The method has great potential for a wide range of applications in basic biological and biophysical research. Thus researchers are already using DNA origami to develop functional nanomachines. In this context, the ability to characterize the quality of the assembly process is vital. Now a team led by Ralf Jungmann, Professor of Experimental Physics at LMU Munich and Head of the Molecular Imaging and Bionanotechnology lab at the Max Planck Institute for Biochemistry (Martinsried), reports an important advance in this regard. In the online journal Nature Communications, he and his colleagues describe a mode of super-resolution microscopy that enables all the strands within these nanostructures to be visualized individually. This has allowed them to conclude that assembly proceeds in a robust fashion under a wide range of conditions, but that the probability that a given strand will be efficiently incorporated is dependent on the precise position of its target sequence in the growing structure. DNA origami structures are essentially assembled by allowing one long single-stranded DNA molecule (the ‘scaffold’ strand) to interact in a controlled, predefined manner with a set of shorter ‘staple’ strands. The latter bind to specific (‘complementary’) stretches of the scaffold strand, progressively folding it into the desired form. “In our case, the DNA strands self-assemble into a flat rectangular structure, which serves as the basic building block for many DNA origami-based studies at the moment,” says Maximilian Strauss, joint first author of the new paper, together with Florian Schüder and Daniel Haas. With the aid of a super-resolution technique called DNA-PAINT, the researchers are able to visualize nanostructures with unprecedented spatial resolution, allowing them to image each of the strands in the nanostructures. “So we can now directly visualize all components of the origami structure and determine how well it put itself together,” says Strauss. As its name suggests, the DNA-PAINT technique itself also makes use of the specificity of DNA-DNA interactions. Here, short ‘imager’ strands linked to dye molecules that pair up with complementary sequences are used to identify sites that are accessible for binding. Imager strands interact transiently but repetitively with their target sites, which results in a “blinking” signal. “By comparing the information in the individual fluorescence images, we are able to attain a higher resolution, so that we can inspect the whole structure in detail,” Strauss says. “This phenomenon can be understood as follows. Let’s say we’re looking at a house with two illuminated windows. Seen from a certain distance, it appears as if the light is coming from one source. However, one can readily distinguish between the positions of the two windows if the lights are alternately switched on and off.” Hence, the method allows the researchers to determine the positions of the bound staple strands precisely, and the specific blinking signal emitted by imager strands reveals sites that are available for binding. The results obtained with the DNA-PAINT method revealed that variations in several physical parameters – such as the overall speed of structure formation – have little influence on the overall quality of the assembly process. However, although its efficiency can be enhanced by the use of additional staple strands, not all strands were found in all of the nanoparticles formed, i.e. not all available sites were occupied in all of the final structures. “When assembling nanomachines it is therefore advisable that the individual components are added in large excess and the positions of the modifications chosen in accordance with our mapping of incorporation efficiency,” Strauss says.